The Brotman Baty Institute for Precision Medicine recently launched the Seattle Flu Study in an effort to better understand how influenza and other contagious diseases spread, which will help inform how they might be better detected, monitored and controlled. 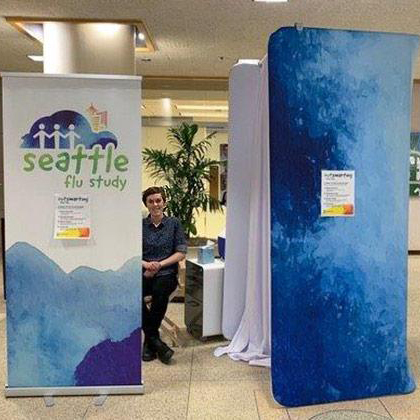 The study will create a first-of-its-kind citywide network for infectious disease tracking by recruiting 10,000 Seattle residents and visitors who show flu-like symptoms. Volunteers who agree to participate at a designated kiosk in the city will be asked to provide a simple nasal swab as well as basic personal and health information. Pathogens found in the samples will then undergo genetic sequencing and be compared genetically and geographically to help researchers better understand how illnesses spread throughout the community.